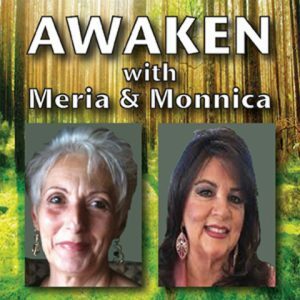 3/19/19 Awaken With Meria & Monnica. The power of numbers and focus; from hockey to Elvis; the left and right brain; Guru? Sun Bear -on students & teachers; love and healing; past lives and how they can be affecting you; can the news be healing? Mercury retrograde in Pisces; Spring is the time for growth; seeing the future; how to turn around a bad day; get your biorhythms bio-chart.com; frequency of 110 Hertz; scapegoat; dig a hole; Guardian angels & guides; how to connect; ask; plant seeds then take action; give thanks daily; data needs no emotional response; how to balance this reality and your spirituality. So happy to hear that Monnica is feeling better. Along with my contribution of Reiki Distant Healing, we did it…YAY! I am so grateful to Monnica for all of the beautiful things she says about Meria. I can confirm everything she says. Every single time Meria has done a Reading for me she has totally nailed it. It is not an exaggeration to say Meria is the BEST! As far as Meria’s News Show goes, anyone who truly wants TRUTH, along with a dose of Humor to make it palatable, would do themselves a favor to Subscribe to Meria’s show. Thank you Meria and Monnica for sharing your love and light.